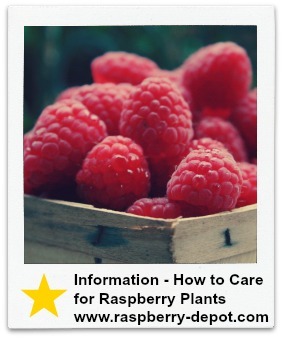 If you grow raspberries, or you are considering growing them, and you are looking for information about how to care for these plants you have come to the right place! 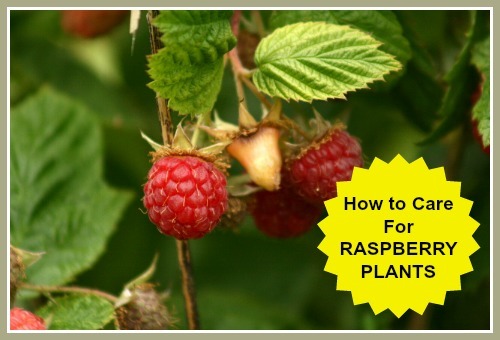 Here you will find very simple, basic instructions for raspberry plant care for the home gardener. By following these easy guidelines, you will be able to enjoy home-grown raspberries year after year. For new raspberry plantings, keep plants well watered, especially during dry periods of little or no rainfall. For established raspberry plants specific watering is not normally required, unless drought conditions exist. If necessary, water raspberries 1 - 2 deep waters per week during the flowering and fruiting season, this is the most critical period of water requirements for the best raspberry plant care. Raspberry plants which suffer from drought conditions will produce smaller fruit. As a general rule, raspberry plants thrive best in full sun conditions. Note that light requirements may vary between different raspberry varieties. For new raspberry plantings, I would suggest you fertilize them about one month after planting. Use organic fertilizer and compost, or use chemical fertilizer, whichever you prefer. We use 10-10-10 for our raspberry patch. In the Fall/Autumn, fertilize the berries again. For established raspberry plants I suggest fertilizing the plants in early Spring with organic fertilizer and compost, or with chemical fertilizer. We use 6-24-24, to enhance both root and flower (fruit) development. After the plants have fruited, apply a fertilizer of 10-10-10 (or your choice of organic fertilizer/compost). When fertilizing the raspberry plants, be careful not to over-fertilize. Do not use more than about 110-150 g/m per row. Spread the fertilizer evenly around the plants, and about 60cm on each side of the row. Concentrated fertilizing applications too close to the roots of the raspberry plants will burn the roots and kill the plant. Manure (well-rotted) is a very good source of organic matter. All organic matter should be free of weed seeds. In order to eradicate over-wintering insect pest and fungal diseases it is advisable to apply dormant oil combined with liquid lime sulphur to the raspberry plants. The raspberry plants should be sprayed with this in early Spring, before any leaf growth appears on the raspberry canes. Dormant Oil / Liquid Lime Sulphur is available for purchase at most Garden Centres, or can be purchased online at *Amazon.com (see below). The preferred application method is the use of a garden sprayer as shown in the images below. As in most gardens, weeds will compete with the raspberries for both nutrients and moisture. It is a good idea to plant dense grass between the rows of raspberry plants, and around the raspberry patch, and keep the grass cut. This will help to prevent weeds from becoming established in those areas. Control existing weeds within the patch and in adjacent areas by hoeing, and digging up perennial weeds as needed. Mowing weeds that have not been removed will help prevent the weeds from flowering and setting seed. It is important to control weeds before they create a new crop of seeds. On new plantings only, (the first year of planting), it is advisable to remove the raspberry blossoms/flowers that appear. This will allow the raspberry plants to become better established, using all the plant's energy to build a strong root system. If desired, raspberry plants can be mulched to conserve soil moisture, and to keep the soil around the plants cool. All mulch material should be free of weed seeds. This is not necessary for optimal raspberry plant care. From time to time, as you go through your raspberry patch, encourage the canes to grow between the lengths of twine in the trellis system you set up when planting the raspberry plants. Raspberry plants must be pruned at the required time. Failing to do so will severely impact the growth and fruiting of your raspberry bushes. It is important for optimal raspberry plant care, to visit your raspberry patch daily when the fruit is ripening. Raspberries should be harvested, (picked), when ripe, every day, or every other day. Do not allow berries to become overripe and rotting on the bushes. Overripe raspberries, and raspberries which have been left to decay will attract insects, for example; Japanese Beetles. These insects feed on the overripe fruit and will, very quickly, prove to become problem pests in the berry patch. If desired, raspberries can be protected from winter conditions by mulching. Unless your raspberry patch is exposed to severe cold and harsh winter conditions, this is not usually required. I live in Ontario, Canada, and we have never protected our raspberry plants for the winter, (and yes, it gets VERY cold here!). If you do decide to protect your raspberry plants, be sure to remove the mulch in the early Spring to help avoid rotting material from affecting the plants. For additional raspberry plant care tips and general information about growing raspberry plants, please refer to the following helpful links below (or use the navigation bars).